Chuuk Lagoon, also previously known as Truk Lagoon, is a sheltered body of water in the central Pacific. About 1,800 kilometres (1,100 miles) north-east of New Guinea, it is located mid-ocean at 7 degrees North latitude, and is part of Chuuk State within the Federated States of Micronesia. The atoll consists of a protective reef, 225 kilometres (140 mi) around, enclosing a natural harbour 79 by 50 kilometres (49 by 31 miles), with an area of 2,130 square kilometres (820 square miles). It has a land area of 93.07 square kilometres (35.93 square miles), with a population of 36,158 people and a maximal height of 443 m. Weno city on Moen Island functions as the atoll's capital and also as the state capital and is the largest city in the FSM with its 13,700 people. Chuuk means mountain in the Chuukese language. The lagoon was known mainly as Truk (a mispronunciation of Ruk), until 1990. Other names included Ruk, Hogoleu, Torres, Ugulat, and Lugulus. Chuuk Lagoon is part of the larger Caroline Islands group. The area consists of eleven major islands (corresponding to the eleven municipalities of Truk lagoon, which are Tol, Udot, Fala-Beguets, Romanum, and Eot of Faichuk group, and Weno, Fefan, Dublon, Uman, Param, and Tsis of Namoneas group) and forty-six smaller ones within the lagoon, plus forty-one on the fringing coral reef, and is known today as the Chuuk islands, part of the Federated States of Micronesia in the Pacific Ocean. At right, a traditionally dressed older Truk man. Dress includes earrings, belt, sleeveless textile pullover, bracelets. Circa 1930s. 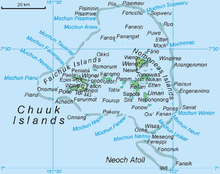 It is not known when the islands of Chuuk were first settled, but archaeological evidence indicates that islands of Feefen and Wééné Islands had human settlements in the first and second century BC. 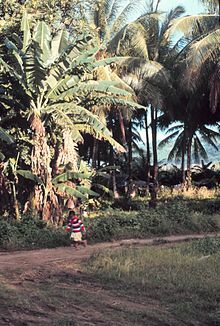 Later evidence indicates that widespread human settlements appeared in Chuuk during the 14th century AD. The first recorded sighting by Europeans was made by Spanish navigator Álvaro de Saavedra on board of the ship Florida during August or September 1528. They were later visited by Spaniard Alonso de Arellano on 15 January 1565 on board of galleon patache San Lucas. The Caroline Islands were sold to the German Empire in 1899, after Spain withdrew from the Pacific in the aftermath of the Spanish–American War. Chuuk then became a possession of the Empire of Japan under a mandate from the League of Nations following Germany's defeat in World War I.
Japanese battleships Yamato and Musashi in anchorage off Truk Islands in 1943. Starved Japanese surrender in October 1945. 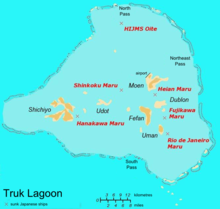 During World War II, Truk Lagoon was the Empire of Japan's main base in the South Pacific theatre. Truk was a heavily fortified base for Japanese operations against Allied forces in New Guinea and the Solomon Islands, serving as the forward anchorage for the Imperial Japanese Navy (IJN). Truk Lagoon was considered the most formidable of all Japanese strongholds in the Pacific. On the various islands, the Japanese Civil Engineering Department and Naval Construction Department had built roads, trenches, bunkers and caves. Five airstrips, seaplane bases, a torpedo boat station, submarine repair shops, a communications center and a radar station were constructed during the war. Protecting these various facilities were coastal defense guns and mortar emplacements. The Japanese garrison consisted of 27,856 IJN men, under the command of Vice Admiral Masami Kobayashi, then Vice Admiral Chuichi Hara, and 16,737 IJA men, under the command of Major General Kanenobu Ishuin. Due to its heavy fortifications, both natural and manmade, the base at Truk was known to Allied forces as "the Gibraltar of the Pacific." A significant portion of the Japanese fleet was based at Truk, with its administrative center on Tonoas (south of Weno). At anchor in the lagoon could be found the IJN's battleships, aircraft carriers, cruisers, destroyers, tankers, cargo ships, tugboats, gunboats, minesweepers, landing craft, and submarines. In particular, Yamato and Musashi, the largest battleships ever built, were stationed at Truk for months around 1943, unable to participate in battle due to lack of air cover. Some have described Truk as Japan's equivalent of the Americans' Pearl Harbor, in that it was their respective nation's largest forward naval base. In 1944, Truk's capacity as a naval base was destroyed through naval air attack. Forewarned by intelligence a week before the US raid, the Japanese had withdrawn their larger warships (heavy cruisers and aircraft carriers) to Palau. Once the American forces captured the Marshall Islands, they used them as a base from which to launch an early morning attack on February 17, 1944 against Truk Lagoon. Operation Hailstone lasted for three days, as American carrier-based planes sank twelve smaller Japanese warships (light cruisers, destroyers, and auxiliaries) and thirty-two merchant ships, while destroying 275 aircraft, mainly on the ground. The consequences of the attack made "Truk lagoon the biggest graveyard of ships in the world." The attacks for the most part ended Truk as a major threat to Allied operations in the central Pacific. The Japanese garrison on Eniwetok was denied any realistic hope of reinforcement and support during the invasion that began on February 18, 1944, greatly assisting U.S. forces in their conquest of that island. Truk was isolated by Allied (primarily U.S.) forces, as they continued their advance towards Japan, by invading other Pacific islands, such as Guam, Saipan, Palau and Iwo Jima. It was attacked again from 12 to 16 June 1945 by part of the British Pacific Fleet during Operation Inmate. Cut off, the Japanese forces on Truk and other central Pacific islands ran low on food and faced starvation before Japan surrendered in August 1945. In 1969, William A. Brown and French oceanographer Jacques Cousteau and his team explored Truk Lagoon. Following Cousteau's 1971 television documentary about the lagoon and its ghostly remains, the place became a scuba diving paradise, drawing wreck diving enthusiasts from around the world to see its numerous, virtually intact sunken ships. The shipwrecks and remains are sometimes referred to as the "Ghost Fleet of Truk Lagoon". Scattered mainly around the Dublon, Eten, Fefan and Uman islands within the Truk group, a number of the shipwrecks lie in crystal clear waters less than fifteen metres (49 ft) below the surface. In waters devoid of normal ocean currents, divers can easily swim across decks littered with gas masks and depth charges and below deck can be found evidence of human remains. In the massive ships' holds are the remnants of fighter aircraft, tanks, bulldozers, railroad cars, motorcycles, torpedoes, mines, bombs, boxes of munitions, radios, plus thousands of other weapons, spare parts, and other artifacts. Of special interest is the wreck of the submarine I-169 Shinohara which was lost when diving to avoid the bombing. The submarine had participated in the attack on Pearl Harbor in December 1941. On 13 November 1973, Kimiuo Aisek, a native Chuukese from Tonoas (Dublon), opened the first dive operation in Micronesia, Blue Lagoon Dive Shop. As a 17-year-old he had witnessed the American "Operation Hailstone" attack Feb. 17–18, 1944. Prior to the attack he had worked with the Japanese as a stevedore and spoke fluent Japanese. Aisek's biography, "Witness To War: Truk Lagoon's Master Diver Kimiuo Aisek" was published by Dianne M. Strong on the 40th anniversary of the dive shop, 13 November 2013. Aisek had purchased the former Truk Continental Hotel in 1998 from Continental Airlines. Aisek had revered the wrecks as grave sites and was an early proponent of conservation and the Truk Lagoon National Monument, founded by the Truk District Legislature in 1972. Known as a wreck finder and dive guide, Aisek hosted many celebrities, including William A. Brown and his three sons in 1988, underwater photographers Al Giddings and Chuck Nicklin, oceanographer-conservationist Dr. Sylvia Earle, John Kennedy Jr., Special Olympics founder Timothy Shriver, NASA's 3-time Hubble astronaut Kathy Sullivan, "Titanic"'s James Cameron, 1980 Miss Universe Shawn Weatherly, TV and film star Bill Paxton, and Australia's "Crocodile Hunter" Steve Irwin. Aisek died at age 73 on 4 January 2001. In 2009 Aisek was the first to be inducted posthumously into the International Scuba Diving Hall of Fame in Grand Cayman. On 13 September 2014 Aisek's son, Gradvin, dedicated the 2400-square foot Kimiuo Aisek Memorial Museum. Located next to the Truk Blue Lagoon Resort and Dive Shop, it is the first museum in Chuuk State. It contains Micronesia's greatest collection of nautical artifacts, and includes a Chuukese ethnographic exhibit. The coral encrusted wrecks attract a diverse array of marine life, including manta rays, turtles, sharks and corals. In 2007, 266 species of reef fish were recorded by an Earthwatch team and in 2006 the rare coral Acropora pichoni was identified. On 12 April 2011, the Australian Broadcasting Corporation (ABC) program Foreign Correspondent screened a report on Chuuk Lagoon likening the effect of the impending massive release of tens of thousands of tonnes of oil from the rusting Japanese warships into the coral reef to that of the Exxon Valdez spill in Alaska. However, given the poor state of the Japanese war effort in 1944, many of the ships may have had relatively small amounts of fuel in their bunkers. Environmental protection organizations are surveying the wrecks while also consulting with Japanese researchers to try to determine how much oil is likely to be in the hulks, particularly in three sunken oil tankers. The ships are classified as a Japanese war grave, requiring Japanese government involvement in the eventual clean-up. Most of the roads and transportation systems are poor or in disrepair; an extensive infrastructural redevelopment plan has begun. It consists of a five-phase project to completely reconstruct the existing sewer, water and storm drainage systems as well as pour 10" concrete roadways in the majority of the villages of Weno. Final contractual bidding was complete in late 2008 and construction began in June 2009. Completion of Phase 1, which extends from the Chuuk International Airport through downtown into Mwan Village and encompassing the roadways to the financial center, hospital, governmental center and projected site of the College of Micronesia is slated for completion by 2012. Surveying for Phase 2, which extends from Mwan Village to Wiichap is underway. The cost for a taxi ranges between a dollar ($1) to two dollars ($2) depending on the distance traveled. Presently, a drive from the airport to the Blue Lagoon resort and dive shop could take up to 35 minutes to complete, although the distance is less than 5 miles. 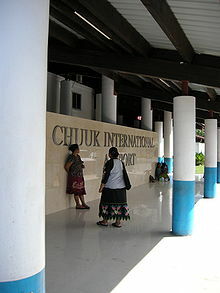 Chuuk International Airport (IATA airport code TKK) is on the administrative island of Moen. It is served by United Airlines, formerly Continental Micronesia, locally known as Air Mike. The government of the state operates a radio station. Interisland communication is often accomplished using citizens' band radio. Telephone services are limited on Chuuk, though a cellular network is established within some islands of the lagoon and in the near future on the outer islands. High speed Internet access via ADSL has been made available on a monthly subscription basis on the Island of Moen from May 2010. Tourism, especially scuba diving among the many wrecks of Truk Lagoon, is the island's main industry with live-aboard dives amongst the most popular ways to see the hundreds of wrecks located in the shallow waters of the lagoon. Copra, dried coconut meat, is the only cash crop and output is relatively insignificant. Most of the inhabitants of outlying islands engage in subsistence activity only. ^ "Weatherbase: Historical Weather for Chuuk Islands, Federated States of Micronesia". Weatherbase. 2011. Retrieved on November 24, 2011. ^ Goodenough, Ward Hunt (1 January 2002). Under Heaven's Brow: Pre-Christian Religious Tradition in Chuuk. American Philosophical Society. pp. 17–18. ISBN 978-0-87169-246-7. ^ Coello, Francisco (1885). "Conflicto hispano-alemán". Boletín de Sociedad Geográfica de Madrid. Madrid. 19: 234, 266. ^ Coello, Francisco (1885). "Conflicto hispano-alemán". Boletín de Sociedad Geográfica de Madrid. Madrid. 19: 241, 242, 289. ^ Hezel, Francis X. (1995). Strangers in Their Own Land: A Century of Colonial Rule in the Caroline and Marshall Islands. Honolulu: University of Hawai‘i Press. p. 70. ISBN 978-0-8248-2804-2. ^ Takizawa, Akira; Alsleben, Allan (1999–2000). "Japanese garrisons on the by-passed Pacific Islands 1944–1945". Forgotten Campaign: The Dutch East Indies Campaign 1941–1942. Archived from the original on 2016-01-06. ^ Costello, John (1982). The Pacific War, 1941–1945. New York: Quill. ISBN 978-0-688-01620-3. ^ a b "Truk Lagoon and the Lost Japanese Ghost Fleet – The Adventure Couple". Live-adventurously.com. 2012-03-08. Retrieved 2013-11-21. ^ Video: Castle Films Yanks Smash Truk (1944). Castle Films. 1944. Retrieved February 21, 2012. ^ Trumbull, Robert (April 30, 1972). "The 'Graveyard' Lure of Truk Lagoon". New York Times. ^ "About Cayman Islands – Grand Cayman, Caribbean Vacation – Cayman Islands". scubahalloffame.com. Archived from the original on 2014-11-13. ^ "Chuuk Islands – The Blue and the Black – Foreign Correspondent". ABC. 2011-05-20. Retrieved 2013-11-21. ^ "Paradise island threatened by wrecked WWII oil tanker – environment – 02 September 2008". New Scientist. 2008-09-02. Retrieved 2013-11-21. ^ "Rainforest Conservation | Volunteer For Animals | Earthwatch News". Earthwatch.org. Retrieved 2013-11-21. This page was last edited on 25 January 2019, at 13:32 (UTC).